Finally, Albacore tuna is available again in one stall at the Queen Victoria market. This tuna is sustainable, it is a lean fish and it can be quite dry if served without a sauce. You can buy albacore tuna cut as a fillet or as slices from the centre of the fish – this cut will include the spinal bones and if you are braising the fish the bones will contribute to the taste. In Sicily this cut of tuna is called a ruota (wheel); the bones can then be easily removed at the time of serving. The wheel of tuna will have the skin still on make sure that the scales have been removed and make splits into the skin to stop it curling. Or you can remove the skin altogether. 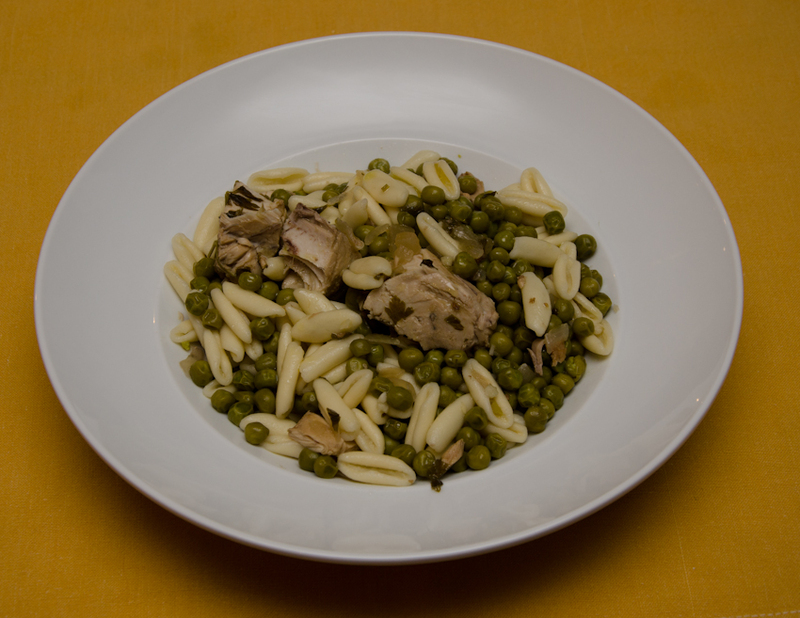 Tuna and peas is a very common combination for Italians. I remember so vividly my maternal grandmother cooking wheels of tuna in very crowded saucepans, bubbling away on her stove in Catania, Sicily. Sometimes she also added tomatoes to the braise and studded the tuna with cloves of garlic. Peas are sweet, hence the cinnamon stick. Sometimes I add nutmeg instead (for the same reason). Both the cinnamon and the nutmeg are optional; if using nutmeg, add it at the final stages of cooking. Once cooked, you can also remove the centre bone, break up the tuna and serve it as a pasta sauce. Sauté the chopped onion lightly in the oil – use low heat. Add the tuna and seal on both sides. Add seasoning, bay leaves, wine and cinnamon stick. Cover and simmer for 15-20 minutes. Add the peas 10 minutes into the cooking and If adding nutmeg add it at this time. Do not let the braise get dry and add a little more liquid (water and or wine) if necessary. 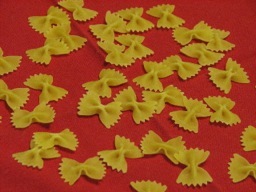 Use 400 g pasta, short shapes. Leave the fish in the pan while you cook the pasta. Remove the central bones from the tuna (if there are any) and return them to the pan. Dress the pasta and serve. Unlike the rest of Italy, Sicilians include grated cheese with fish. Calamaretti is the diminutive of calamari and Italians do mean small. This is a common recipe for braised calamaretti. 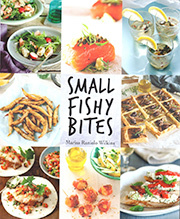 In Australia it is often difficult to purchase small sized squid or cuttlefish, but do your best. A tegame, is a shallow pan. The photo of this squid was taken in the fish market in Catania, however I have been extremely pleased with the squid from my fish vendor (Happy Tuna stall in the Queen Victoria Market) and I have been buying it frequently. I particularly like char grilled calamari with a salmoriglio dressing (oil, lemon, parsley, oregano). However, a simple braised calamari is also a good alternative, especially in winter. For a main course you will need 3 kg of young calamari or more because they shrink. Potatoes and peas are often included in this dish. TOMATO SALSA: fresh, peeled, ripe, chopped tomatoes or a can (with the liquid), a little extra virgin olive oil, garlic cloves left whole, fresh basil or dried oregano and a little seasoning. Place all of the ingredients into a pan together and evaporate until thickened. Add a little sugar, more olive oil and some extra leaves of fresh basil. Prepare the squid by removing the head with a sharp knife. Open the body and remove the internal organs. Retain the ink sacs and freeze them if you wish to use them at another time (see recipes……..). Wash or wipe the squid and cut into strips. Heat the oil in a frying pan and sauté the peeled chopped onions lightly. Add the squid, stir for 3 minutes, and pour in the white wine, salsa and potatoes, season with salt and freshly ground pepper. Cover and cook gently for 30 minutes. 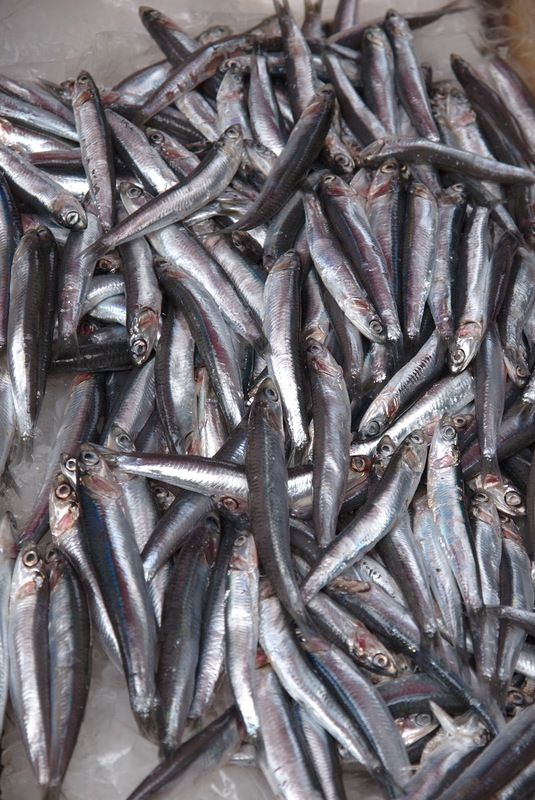 Add 4 chopped anchovies, to above recipe. When in season add peas, (2 cups shelled). In Spring we get broad beans and fresh peas. Artichokes (one name for them is cannolicchi in Sicilian) are also available and the combination of these three vegetables is very common in Italian (includes Sicilian) Spring recipes. The recipe and the name of this dish is taken from the menu of one of Sicily’s outstanding restaurants the Charleston, found in Mondello on the outskirts of Palermo. I do not know why the restaurant is called by this name, but speculate that its size and grandeur is reminiscent of the popular, dance halls of the twenties. 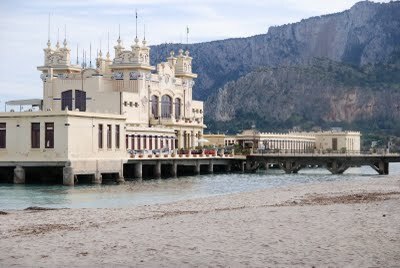 It is a lively, glamorous restaurant on the water, with top food and reputed to be frequented by pezzi grossi (slang for people who mean business). The Charleston is a popular restaurant and the menu represents the best of Sicilian traditional dishes, wines and quality produce. 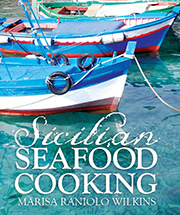 Each traditional dish is modern in its presentation and very different to Sicilian food one generally eats in Sicily. Using tubular pasta will help to trap the sauce and cannolicchi are suggested in the recipe. These are cylindrical shaped, hollow pasta ranging from 50-60 mm in length with a smooth surface; other large tubular pasta can be used. The vegetables are cooked very quickly. The softer centre and the fondi of the artichokes (the tender, fleshy parts at the base) are used in this dish, so you can purchase the larger, fleshy, artichokes which are very common in the Queen Victoria Market. The pasta dish is similar to a warm salad. I make the sauce while the pasta is cooking to better preserve the colours of the vegetables (the different shades of the colour green). In my recipe I add herbs at the end of cooking – mint or fennel fronds (cut finely) or fresh basil (not yet in season). I also like to include a spoonful of fresh ricotta on each person’s plate. artichokes, the fondi (bases)-depending on the size of the artichokes I usually buy 5 large artichokes and use the stalk as well. lemon, 1 for acidulated water. Prepare the artichokes by first removing all of the leaves and only keeping the tender centre and its fleshy base. Remove the choke if there is one. The peeled stalks and the artichokes should be sliced finely. Keep in acidulated water until ready to use. Boil the water, add salt and cook the pasta and make the sauce while the pasta is cooking. Heat the oil and add the onion. Stir gently until golden and softened. Add the vegetables and toss till they begin to change colour and have softened (about 7-10 mins). Add salt during cooking. Add fresh, finely chopped herbs before the end of cooking.. Drain the pasta, add the sauce and toss gently. Present it with grated pecorino and black pepper. I hope to eat at the Charleston again (I arrive in Palermo within the next few days). Because it will be autumn, these will not be on the menu, but I am pretty certain that whatever I eat will be seasonal and fabulous. Today in Venice, Venetians are celebrating the feast day of their patron saint (25 April, the date of the death of San Marco). Risi e bisi the classic Venetian dish was traditionally offered to the Doge (do not know which one) on April 25, the feast of Saint Mark. This is not surprising, it is spring in the northern hemisphere and peas are one of the symbols of the season. It is a public holiday in Venice and all sorts of events take place. Although Venetians celebrate his feast day they also celebrate Liberation Day (liberation from the Nazis at the end of 2nd World War) and Festa del Bòcolo (is a rose bud) and it is customary for all women, not just lovers, to be presented with a bud. The very old legend concerns the daughter of Doge Orso Partecipazio, who was besotted with a handsome man, but the Doge did not approve and arranged for the object of her desire to fight the Turks on distant shores. The loved one was mortally wounded in battle near a rose bush. There he plucked a rose, tinged with his heroic blood and asked for it to be given to his beloved in Venice. I grew up in Trieste (not far from Venice and in the same region of Italy) and risi e bisi is a staple, traditional dish. The traditional way of cooking it does not include prosciutto but prosciutto cotto, what we call ham in Australia. Poor tasting ingredients will give a poor result; use a good quality smoked ham. As an alternative some cooks in Trieste use speck, a common ingredient in the region (it tastes more like pancetta). Some of the older Triestini use lard and only a little oil. My mother also added a little white wine to the soffritto of onion and the ham, but this also would have been a modern addition. The butter is added last of all for taste. Use parmigiano – parmigiano is the cheese used in the north of Italy, pecorino in the south. The secret is in using good produce, preferably organic, young and freshly picked peas (for their delicate taste) and a good stock. My mother made chicken stock. If she had no stock, she used good quality broth cubes- very common in Northern Italian cooking. Heat the olive oil, add ham and onion and over medium-low heat soften the ingredients. Do not brown. Add the shelled peas, parsley and when they are covered in oil, add very little stock (to soften the peas), cover and cook for about 5 minutes. Add the rice, and stir, add the wine (optional) and evaporate. Keep on adding the hot stock, stirring the rice and adding more stock as it is absorbed. End up with a wet dish (almost soupy and all’onda as Italians say) and with the rice al dente. In fact, the dish should rest for about 5 minutes before it is served so take this into consideration (the rice will keep on cooking and absorb the stock). Add parmesan and butter, stir and serve.